Delectable Desserts - Our exquisite desserts are the perfect ending to every meal. You'll find something to satisfy everyone's sweet tooth from creamy cheesecakes to rich, dense chocolate desserts and a host of other specialty delicacies! Add a decadent finale to your dinner party, wedding or other special affair with our NEW gourmet desserts. These lusciously exquisite dessert are the type of specialties you would find at the finest restaurants. These make excellent hostess gourmet gifts or corporate gifts too. Baklava, lava cakes, cheesecakes, chocolate cake, carrot cake dessert, gourmet apple cobbler pie and other delectable delights complement any event with a sinfully sweet ending. An undeniable favorite - this Carrot Cake is luscious and moist beyond belief. We use freshly grated carrots, crushed pineapple, crunchy walnuts and the perfect blend of spices. Then we use classic cream cheese frosting and chopped walnuts to create an appealing presentation. Serves 6-8. The Chocolate Fantasy Cake is a moist chocolate cake topped with a creamy chocolate fudge frosting. A beautiful yellow frosting rose adorns the top of the cake. 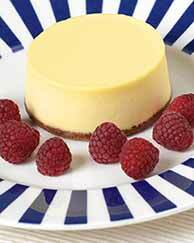 Home Bistro Chef Prepared Desserts made fresh daily. We create great recipes - everything from soups and appetizers to complete meals and desserts. Then, using only the finest ingredients, we prepare everything, with skill, know-how, and artistry, just for you. We do all the time-consuming things. We shop and we chop. All you need to do is follow the simple instructions to heat and serve our meals in about 10 minutes. It's that easy. 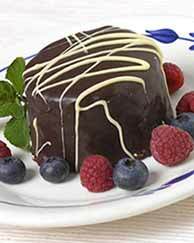 Simply luscious, our moist chocolate cake covered in a rich chocolate frosting. A dessert for any occasion. 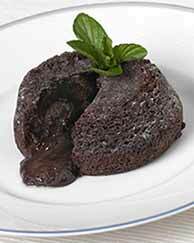 The delightful aroma of rich, dark European chocolate fills the air when you cut open the delicate chocolate cake to reveal the molten center. Served warm. Each box contains 6 individual servings. Now this is dessert! The rich creamy, authentic classic. Each box contains 6 individual servings. � Copyright 1995 - 2006 Gourmet Food Appetizers.. All Rights Reserved.